Well, the beer is bottled and is being consumed. Allow me to show you what’s happened with it. 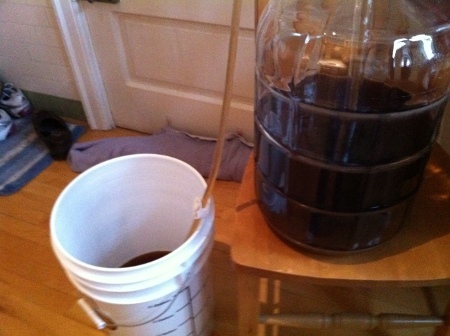 When we last left the beer, it had just been transferred from plastic primary to glass secondary fermentation. This allows the beer to get a bit of a swirl and leaves all the sediment behind allowing for a clearer beer. This being homebrew, it’ll never be completely clear, but it really does help. After a week or so in secondary, it was time to bottle. Helping me this round was Dave. The bottling bucket the beer is transferring to has priming sugar, a little more sugar to wake the yeast up so it eats a little more while in the bottles. The plastic bit at the end of the tube pushes in when you hit the bottom of the bottles and, without a lot of air, allows beer to flow out of it. Some people buy new bottles, I was cheap and collected/drank my way to 40-60 bottles (and did a nice thorough cleaning of them before using them). There it is, my first homebrewed beer in 12 years. 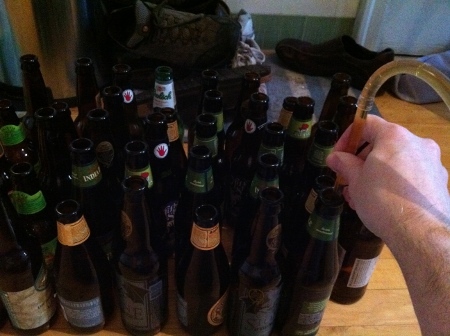 I got 41 bottles of beer, but I should have had over 50. I lost a lot due to lacking extra water during the initial steps. Next time, I’ll remember to have 6 gallons of water as a lot of it boils off/spills into the stove when cooking the wort. At this point, the bottles were moved to a closet. The yeast, with it’s priming sugar treat, will now keep eating the sugars. In the fermenters, the CO2 that is the end product of the yeast eating the sugar was able to escape out of an airlock in the top of the carboy. 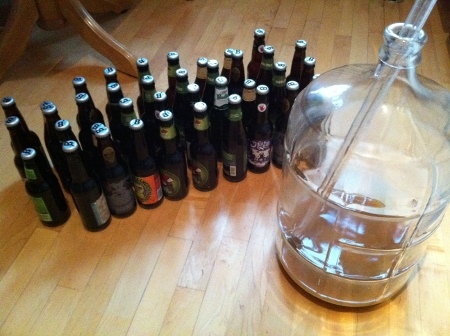 Now, in the bottles, they are trapped by the beer caps and provide natural carbonation for my happy English bitter-style beer. A week later, I had my first sample. Let’s go to my stylish photo of the end product. Behold! Beer! 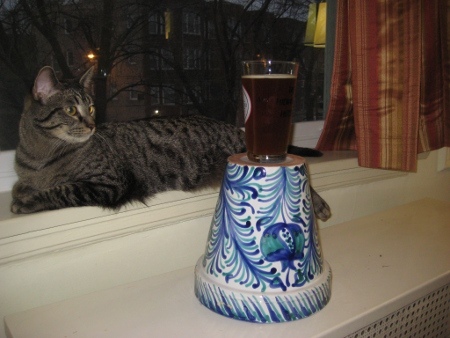 And a curious cat wondering why a glass is sitting on top of a flower pot. It’s a little dark, but the color was a nice medium brown and, while cloudy, was not too bad. I initially sampled it in isolation, with Carolyn around in case it tried to kill me. The taste was pretty good. I’ll be honest, I’m terrible at the whole describing flavors thing, but it was in line with a tasty session beer. The one you might drink over the course of an afternoon in a nice sunny pub. Not too exciting, but very drinkable. I’ve passed out a few for other judgments and, either my friends and neighbors are very very polite, or they truly enjoyed the beer. Success! This entry was posted on Tuesday, March 22nd, 2011 at 6:33 pm	and is filed under Chicago, Photos, Rogers Park. You can follow any responses to this entry through the RSS 2.0 feed. Both comments and pings are currently closed. Bring in some for your thirsty co-workers. Entries (RSS) and Comments (RSS).22 queries. 0.313 seconds.